The flatev family is growing! We’re excited to welcome Tanja Meier as the Executive Assistant in Zurich and Sandie Cheng as the Communications & Project Manager in New York City. 1. If we’re passing by your hometown, what’s something we must experience? Tanja: It’s best to visit Lucerne in the summer and go for a swim at the Vierwaldstättersee “Seebad Lucerne,” where you can cool down your body and enjoy the stunning view of the mountains simultaneously. In the evening, it turns into a bar, so you can have your cocktails there too. My favorite coffee place is “Alpineum” they have the best coffee in town & provide you with healthy and delicious meals over lunch. Next to the café/bar you can visit the lion monument, a huge lion sculpture of stone, that commemorates the braveness of the Swiss Guards who were massacred during the French Revolution. Sandie: There’s an awesome burger place in Riverside called Johnny’s Burgers (not to be confused with the chain). But if you’re not into that, then I would suggest walking around downtown Riverside where the beautiful Mission Inn is located. It’s especially beautiful during Christmas, where they have the annual Festival of Lights. There’s also an amazing art movement happening in Riverside right now. People may think it’s a boring place compared to the rest of California, but there’s quite a lot of charm to it if you’re open. And it’s home. 2. How are you using your education today (What did you study in school)? Tanja: I studied Business Administration. I would say that I use my general understanding for the economy and corporations everyday. It is knowledge about how an organization works, that helps me to work most efficiently at my work. I don’t use my knowledge I acquired at university one to one, it’s more about the methods and conceptual thinking. 3. It’s the weekend, where are you and what are you doing? Tanja: If it’s sunny, I’d probably visit the flea market at Helvetiaplatz. Otherwise, I might go to the thrift shop and also meet some friends for coffee. Then maybe dinner with friends at home and hang out at a nearby bar afterwards. But I’ll also do sports and relax at home, like reading or watching series. Sandie: I think I used to be a crazy person, so every weekend I’d be partying and dancing at some bar in the Lower East Side. Now, I think I’m more likely binge watching something on Netflix or going to bottomless brunch somewhere with friends. 4. Do you have any TV shows to recommend? Tanja: Popiah – a traditional Singaporean dish that wraps veggies, fried tofu, shrimp, garlic, and different sauces into one delicious fresh spring roll. Sandie: This question is so hard. I love all foods, really. 6. What brought you to flatev? 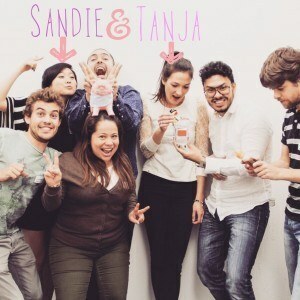 Tanja: An inspirational idea and the desire to work in a startup atmosphere, that is both, flexible and fun but also professional and goal focused. Sandie: The people. They are so passionate and genuine. But most of all, they are so fun and open to new cultures. It was so easy to become a part of this family. https://flatev.com/wp-content/uploads/2017/05/logo-300x133.png 0 0 Sandie Cheng https://flatev.com/wp-content/uploads/2017/05/logo-300x133.png Sandie Cheng2015-03-09 19:03:572015-04-16 14:57:25Meet Tanja and Sandie!